Tired of conventional coffee shops? SGD Coffee is the place to go! They offer quality coffee beans bought from farmers in Sagada to help them get recognized for their flavorful and specialty grade Arabica coffee beans. SGD Black (right). Freshly roasted coffee. Php120. Flat White. A drink topped with silky textured milk. Php145. SGD Cold. My personal favorite! Created with a thick foam that does not mix with the black coffee. Php175. Etag Carbonara. Your favorite pasta level-uped with Etag, sagada’s traditional smoked pork. Php220. Sagada Omelette. Enjoy your carbonara the sagada way, filled with veggies, unfolded. Php200. Inadobo sa Kape. 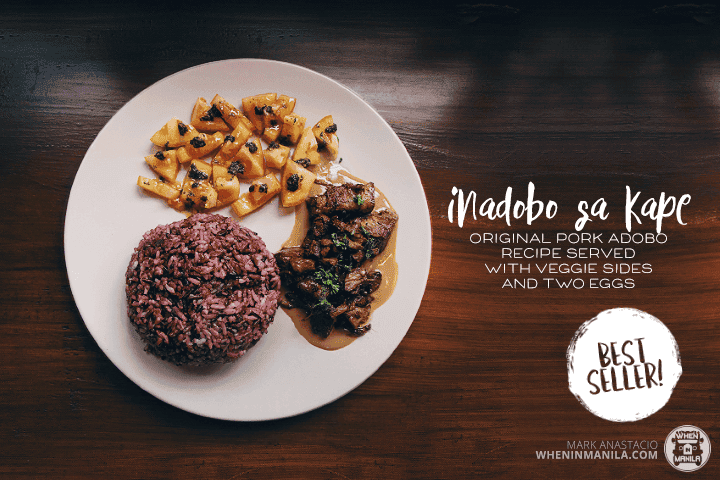 A new way to enjoy adobo, with coffee sauce. Php220. Longganisa. Skinless, and handmade, their longganisa also contains Etag. Php220. Affogato. A must-try dessert made with their own ice cream. Php155. SGD Yoghurt. Topped with Bugnay Jam from Sagada. Php120. SGD Yoghurt. Topped with Honey and Banana. Php120. (L-R) Revel Bar Php65, Oatmeal Orange Cookie Php60, and Buttercream Bar Php85 served on their repurposed plates. Aside from their flavourful coffee and coffee-complementing food, SGD Coffee also offer workshops for coffee enthusiasts and those who want to learn about the science of coffee. SGD Coffee holds a coffee-planting event every year, where volunteers can plant coffee seeds to lend a helping hand to the aging coffee farmers. The event is a great opportunity to gain first-hand experience on how SGD Coffee gets their premium coffee beans. SGD Coffee gives you a taste of Sagada with every sip and bite.